Arkansas, California, Florida, Georgia, Illinois, Indiana, Iowa, Kentucky, Maryland, Michigan, Mississippi, Missouri, North Carolina, Ohio, Oklahoma, Oregon, Pennsylvania, South Carolina, Tennessee, Texas, Utah, West Virginia, and Wisconsin. The 2018 Grand National Championships will be held Nov. 8–10 at Lucas Oil Stadium. In 2017, Carmel swept captions and was named Grand National Champion for a second consecutive year. This year’s Grand National Championships kick off bright an early Thursday morning with a new system of adjudication that allows the elimination of most breaks throughout the day. While a typical block of performances in years past was limited to around 10–14 bands followed by a break, this year, there are stretches of as many as 30 performances back-to-back. For our purposes below, we’ll group bands into blocks based on adjudication panel. Those bands colored green are ones we consider a lock for semifinals and those in yellow we consider on the bubble for semis. Kicking off the 2018 Grand National Championships on Thursday morning will be the lone band from the lone star state. Prosper is certainly a group to look out for this year. 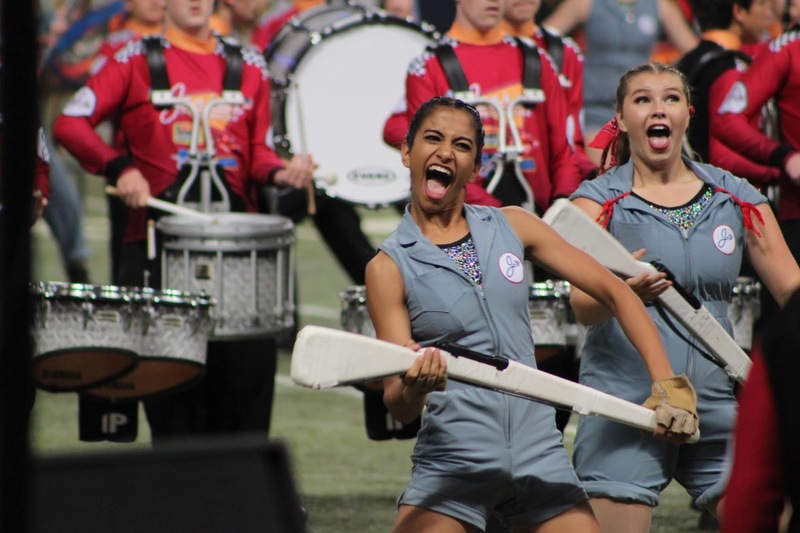 After finishing just two spots outside of finals this past weekend in San Antonio, they are certainly within striking distance of a Saturday night performance.In previous years, we’ve seen bands miss finals by larger margins in San Antonio and still make finals a few days later in Indianapolis. Lakota East has made finals at two BOA events this year: claiming 13th in Indianapolis and third at Bowling Green. With this in mind, this program could certainly earn a spot in semifinals. Rockford is another band on the semifinals bubble. After a fourth place finish at Bowling Green, we think they could edge out some other heavy hitters who are competing for a Saturday performance. The early afternoon block of bands consists of many regional finalist bands hoping to earn a spot in semifinals. Starting off the group is Central Hardin who placed tenth at Clarksville. They are followed by fellow Kentucky band, North Hardin. North Hardin is a consistently high achieving group that we expect to make semifinals. They also were at the Clarksville, TN regional and earned fourth behind some great bands. Speaking of Tennessee, be sure to catch Father Ryan at 1:30 p.m. This AA group always brings a high level of individual achievement that allows them to compete with much larger bands. Unfortunately, they’re being judged by the same panel as Marian, North Hardin, and Tarpon, so they won’t be able to advance based on class representation. The band placed sixth earlier this year in Jacksonville. At 2:15 p.m., we get to see former Grand National champion Plymouth-Canton. They are another group that could be right on the bubble of semifinals after a seventh place finish at Bowling Green. Closing out the second block is Green Hope from North Carolina. Green Hope is a consistent regional finalist and placed 10th at the 2018 Gaffney Regional. Dobyns-Bennett headlines the Thursday afternoon block. Coming off an impressive top six finish at Grand Nationals last year, the Tennessee group is poised for another top half finish. You won’t want to miss their massive stage and vibrant colors that are brought to life on the field. Nation Ford is another group to watch this year. So far, they have placed third and fifth at the Jacksonville and Gaffney regionals respectively. Their 2018 program, “From the Other Side” features an impressive musical repertoire including Shostakovich Symphony No. 10. Castle looks to regain momentum with their prelims performance on Thursday. After two straight Grand National finals appearances, the band placed third in Clarksville and eighth in Indianapolis, several spots off of their placements the past two years. O’Fallon Township has had a tremendous 2018 season as they secured a regional victory in Clarksville and a fifth place finish at the St. Louis Super Regional. Their stark white, endzone-to-endzone, full-field tarp is one of the most bizarre and impressive sights you will see at Grand Nationals. “Tarp Town” is far more than a gimmick, as the spread creates a truly powerful visual impact in contrast to the band’s dark uniforms. Closing out the block is a band coming back into the finalist discussion. After an incredible climb to fourth place at the 2015 Grand National Championships, William Mason spent last season on the outside looking in. An impressive early season win in Bowling Green sets them up nicely for a strong finish to the season. If you had to choose only one prelims block to go to, make sure it is Thursday night. It features SEVEN bands that have made finals within the past ten years. Avon begins the night block and we really shouldn’t need to convince you on why you need to be there right no time. They are one of the best music programs in the country and will blow your socks off. Lawrence Township and Center Grove are two more Indiana groups that perform directly after Avon. Although following up a finalist lock is difficult, both of these groups are certainly up to the task after each producing impressive finalist placements at the Indianapolis Super Regional. American Fork is a huge wild card at this year’s competition and is travelling all the way from Utah. The band is consistently a top performer on the west coast and placed just shy of former Grand National finalist Ayala at St. George. Could this be the year that they push through to finals? Homestead is once again in a solid place to make finals at Grand Nationals. Over the past few years, the band has become a consistent finalist and they look to continue the streak this year. Speaking of streaks, possibly the biggest question of the weekend will be whether Carmel can three-peat. Performing at the very top of the national stage is an incredible feat, but doing it years in a row is absolutely amazing. The Carmel visual package is always mesmerizing and engaging. The quest for #3 starts at 9:15 PM Thursday for the Marching Greyhounds. But wait, there’s more! Wando, one of the top bands from the southeast will prove why they are another finalist caliber band. Wando has a new look, but their 2018 program continues their tradition of excellent performance. The individual level of achievement from this group makes them one of the most impressive groups in the nation. This block also contains a huge group of bands on the bubble of snatching a semifinals spot if everything works in their favor. Jenison, Greendale, and Reeths-Puffer have all been in within 10 spots of semifinals in recent years, and Adair County should advance on class representation if they're unable to advance based on score. Centerville and Morton, who have both made finals at super regional earlier this season round out the Thursday prelims performances. Although you may have been up late Thursday watching some incredible groups from the night block, make sure you set your alarm early to make it in time for several great bands performing early Friday morning. Kennesaw Mountain’s last trip to Grand Nationals was in 2014 when they placed eighth overall in finals. Although, the past few seasons have not been as strong, they have found their new direction over the last two seasons. This year, the band has impressive second and third place finishes at the Jacksonville and Powder Springs regionals behind talented groups like Harrison and Wando. Franklin is looking to bounce back on the national stage after dropping down to 27th last year in semifinals. Prior to that, the band had placed as high as 15th in 2013 and 13th in 2015. Their 2018 production, “Out There”, features a space theme centered around the Russian Sputnik launch. Fort Mill, Camdenton, and Bentonville each perform in the middle of this block, so you'll want to hold off on taking a break just yet. All three will be pushing for a spot in semifinals, and with few class AA bands assigned to panel 2, Camdenton could be able to earn a semifinalist spot on class representation, even if they don't on score. One of the farthest travelling bands this year is Homestead from California. They are another consistent top performing finalist at west coast regionals and look to represent the California bands at Grand Nationals this season. We expect them solidly in semifinals. Closing out the morning block is Blue Springs. The Missouri band has achieved some impressive milestones over the past few years and they don’t plan on stopping anytime soon. This year, they tied Broken Arrow for the GE caption in St. Louis and finished within half a point of the perennial powerhouse. That alone is enough to be proud of for the 2018 season, but we have a feeling the could turn some more heads this weekend in Indianapolis. The second block of the day starts off with a bang. Tarpon Springs will be bringing their production, “Ready Player One”, to Lucas Oil Stadium at 10:30. Tarpon Springs brought home the Eagle in 2014 and had an impressive fourth place finish in 2016. Could they take the championship back home to Florida? Either way, this show is a lot of fun to watch. Mustang is a semifinals bubble band from outside of Oklahoma City who we haven’t seen much of this year. However, they recently placed sixth at their state championships. We are excited to see what they will bring to Indianapolis! DeSoto Central is the sole band traveling from Mississippi this year. They made semifinals last year at Grand Nationals and hope to repeat that this year. They have already racked up to finalist performances in Jacksonville and Powder Springs in 2018. Jenks from Oklahoma could be a very interesting group to watch this weekend. After a very impressive performance in St. Louis, they have their sights set on making finals. After a third place finish behind Grand National finalists Broken Arrow and Blue Springs, they certainly have what it takes to jump into the top twelve. Panther Creek has the tough task of following Broken Arrow this year. However, the North Carolina band has a strong record of regional finalist placements and placed eighth this year at Gaffney. Expect another strong showing from them! We have been lucky to see several groups travel from California over the past few years, but this year we are being treated to another group from the west coast! West Salem makes the long haul from Oregon. While many fans from the rest of the country haven’t heard of them, West Salem will be a familiar name by the end of the weekend. The band won the Pleasant Hill regional earlier this year against some tough California competition. The final block of the preliminary competition features many midwestern groups that will be vying for a semifinals spot. But first, is a solid semifinalist and perennial finalist, Marian Catholic. Marian Catholic has not missed a Grand National finals. It is one of the most impressive streaks in the performing arts. There had been many questions about whether they would make finals the past few years, but they still pushed through into Saturday night. While a seventh place finish at St. Louis isn’t ideal, nobody cleans a show better than Marian Catholic in November. Fishers had an impressive showing at the Indianapolis Super Regional as they finished in the top half of finals. In addition, they held off a previous Grand National finalist in Castle. We expect them to be a solid semifinalist lock. Closing out over 100 bands competing in prelims is Siegel from Murfreesboro, Tennessee. The band had a good sixth place finish in Clarksville behind some very notable programs. More recently, they placed second in a Tennessee competition to Franklin. They will have a massive crowd to perform for as they try to lock up a semifinals spot. I’m not sure if the snarky comment above was necessary, but we all know American Fork is a great program. I enjoyed your show in 2013 when you guys came up to GN, and I’m looking forward to seeing it this year as well. remove your comment. you're putting a bad rep on American Fork marching band. To all those who doubted...AF finished 16th in semis - right between Marian Catholic and Franklin - with a score of 86.500, missing finals by 1.025 points. If that's not impressive at this level of competition I don't know what is. (This from a non-affiliated bystander.) You are vindicated, my friend. Props to you and the whole AF band for showing you can compete on the national stage. Where are all the TX bands for Grand Nats this year? San Antonio SuperRegional will be even more important this year. The Prosper Mighty Eagle Marching Band will be representing Texas proudly! I have been to the Indianapolis Super Regional and watched the St. Louis and San Antonio Super Regional through flomarching. I can confidently say this should be between Broken Arrow and Tarpon Springs. normally I would agree but as good as Broken Arrow's show is it is very repetitive visually and not very complicated. It is very clean and they sound fantastic. Tarpon is great as usually but visually they are not as strong as some other groups. GE will be amazing of course, but the judging panel for the past couple years has really gone for bands that sound fantastic. The BAND sound is fantastic, not the front ensemble sounds fantastic and is overpowering as most schools are going to. Never count of Carmel. They just sound awesome!!!! And they are visually stellar. Just my thoughts. I do believe that the top 5 will be a shoot out however. I hope your opinion is based on you already seeing BA's show this year. I am not a fan of their previous year show, but this year I fine it hard to say their show is repetitive visually and not very complicated. That said, I do get that what may be quite an entertaining show to the masses ,may not be appealing to a judging panel. It should be an awesome and very exciting finals regardless. Yes I have seen BA's show. I really like their show, don't get me wrong. It is definitely a top 3 show, but I just think their visual package is a little repetitive at times. After seeing Carmel last night......they are GOOD!!! I would have Blue Springs higher just base on their placement in St. Louis and being only .4 points behind BA. I think Blue Springs show is better than Carmel and Avon. Agreed. Prosper should be in. Not to even mention that last year Round Rock managed a GN Finals appearance after an 18th place finish at San Antonio. Prosper finished 16th at San Antonio this year, and they won't even have to worry about contending with other San Antonio front-runners at GN like Round Rock did in '17. Can we get some love for Lakota East??!!! great show this morning!! Really enjoyed it!! It was a great season. They are really becoming one heck of a band! Mason got 3rd in 2016. Only on the outside looking in for one year. It's Tarpon, baby. This is their year. How many bands engage the audience the way they do with this package? They keep setting the bar high, this isn't your parent's marching band. Broken Arrow definitely engaged the crowd with every performance and I'm not from BA. Who else didn’t see that coming? Im actually from Tarpon and to our finals run brought our whole instructional staff to tears, alobg with every performer. Literally no one cares about the placing, we were just so happy that we had a great finals performance. Not to mention 7th in semifinals! That's a worthy achievement.